You need to look your best as you may well be on TV! An umbrella probably makes sense too. This scribble was published on Wednesday, November 5th, 2008. You can follow any banter on this scribble with the RSS 2.0 feed. You can share your inspired musings after typing the anti spam word near the bottom of the page. But no Pinging because its too naughty. Bees are sapient species of insect from planet Melissa Majoria. This is according to the last series of Doctor Who, so it must be true. 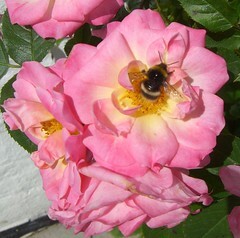 I didn’t see many honeybees this year, plenty of bumblebees though. Last year, honeybees lived in my chimney… Tell a lie, mid-summer I planted up my front garden with lavender and then I had honeybees and butterflies aplenty…. Plenty of bumblebees this year, though I’ve not persuaded them to use the nest boxes yet. Honey bees were thin on the ground, though. Which might explain why the cherry tree wasn’t very productive this year. destined to lead us down the Doctor Who path. characters in an earlier entry!